At TASIS Dorado, we are blessed in many ways. The vision, courage, and generosity of our founders has resulted in a flourishing school and community with an international perspective, which we trust will outlast the current challenges we all face together. In 14 short years, our school has grown in size and beauty even as enrollment has increased to over 750 students from PPK to 12th grade. Our campus has been enhanced most recently with the Performing Arts Center and technology has been added steadily to classrooms at all levels. Curriculum and programming have grown in scope and quality. Earlier this year, our Early Childhood Program was awarded a Program of Distinction honor, while upper school students took part in 22 AP Courses. Our students continue to gain admission to many competitive colleges and universities both abroad and on the island. TASIS Dorado students and teams have won top honors in athletics, mathematics, science and many other extracurricular activities at the national and international level. We have great reason to be proud of our students, teachers, curriculum and campus! It is from this position of strength – our drive for continual improvement and recognition that our needs are always evolving – that the strategic-planning committees sought to further raise the bar. Equally important, the world is increasingly complex, technology is accelerating change and global connections are a necessity. Educational approaches that were effective in the past will need to adjust for the future. To prepare our students for these new demands, we must be flexible, responsive and adaptable. Our commitment as a school remains firm to deliver on our mission with passion, joy and love. 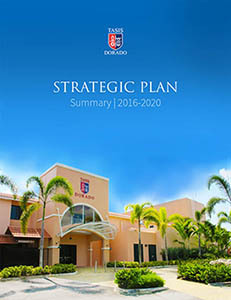 So, in the spirit of academic excellence, development of the whole child, the strength of our PPK-12 community, and recognition that the School’s culture and environment are valued, we embark on our Strategic Plan 2016- 2020. The strategic planning process has allowed us to articulate who we are and whom we serve, and move us forward. I am enormously grateful to all those who have contributed to this plan and for the constant care and support of our entire community! Together, we will achieve these ambitious goals and help our students pursue their dreams!